Excerpt: Sand is much more fascinating than what you see through an hourglass. As any dedicated sand collector will tell you, observing sand with a microscope reveals a world of minute wonders. Lovers of sand (known as psammophiles) comb beaches and deserts around the globe to collect sands and study their unique qualities such as grain shapes, colors, textures, components, and other characteristics specific to sand’s location and geography. 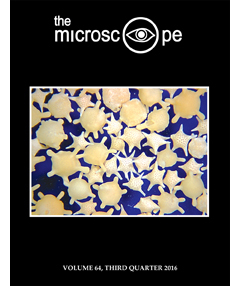 Inter/Micro 2016 featured the very popular workshop, Microscopy of Sand, taught masterfully by Thom Hopen and Kate Clover in June 2016 at McCrone Research Institute. Excerpt: The 68th annual Inter/Micro international microscopy conference, held at McCrone Research Institute in Chicago on June 6-10, hosted leading microscopists and researchers from around the world, including the U.S., India, Israel, Taiwan, Germany, the Netherlands, and U.K. Participants heard in-depth research presentations by amateur, professional and graduate-student microscopists, who covered advancements in instrumentation, new techniques and practical applications in various fields of microscopy and microanalysis. Presentations focused on PLM, SEM, EDS, Raman microscopy, hot-stage and infrared microspectros-copy; microchemistry; forensic trace evidence and criminalistics; pharmaceutical sciences; materials analysis; environmental health; food analysis; and air quality. Excerpt: Our media may be full of fabulously expensive physics and overwhelmed by costly astronomy, but the real marvels are closer to home. And while theoretical physicists search for mathematical models to fit what they choose to observe, living cells are already carrying out processes that are far more ingenious. Biological microscopy can reveal more to us than fairytale physics. Abstract: An English translation of the original Duc de Chaulnes method for determining refractive indices (RIs) of sections is provided, including a description of his own microscope. Other related references are also included, as well as a modern graphical procedure for determining RIs accurately and rapidly with any microscope objective, based on a refined Duc de Chaulnes method. 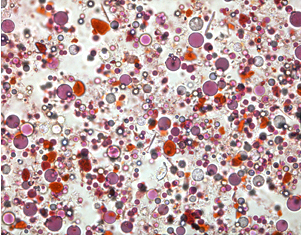 Pink and colorless microspheres in lipstick; brightfield illumination. Hargrave’s image was selected Best Photomicrograph in the Inter/Micro 2016 Photomicrography Competition (see page 100). Copyright © 2016 Microscope Publications, Division of McCrone Research Institute. All rights reserved.